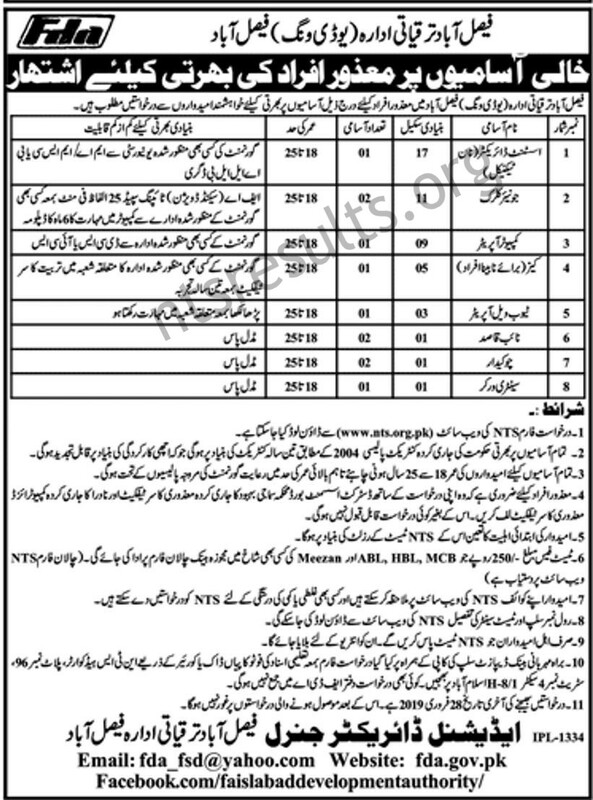 Download application form for Faisalabad Development Authority FDA Jobs Via NTS from here. Last date to apply is Thursday, 28th February, 2019. The Faisalabad Development Authority is a body responsible for undertaking and monitoring planned developments in the city of Faisalabad, in Punjab, Pakistan. The body acts as a regulatory authority for overseeing the construction of houses, commercial developments and residential areas in the city. UD Wing of FDA are invited application from disable persons to fulfill the posts in FDA. The jobs are offered on contract basis for the period of three years. All those candidates who are eligible for the Faisalabad Development Authority FDA Jobs Via NTS must apply to avail this golden opportunity. Applying procedure as well as other requirements for the jobs in FDA are mention below. How to Apply For Faisalabad Development Authority FDA Jobs Via NTS ? NTS test fee which is 250 can be pay in any branch of HBL, UBL, MCB, or ABL. Disable persons attach disability certificate with application issued by the District Standing Medical Board. Roll no slip will be directly dispatch to the candidates at least one week prior to the test. Last date to apply is Thursday, 28th February, 2019.